We did have an excellent question arise that needed to be addressed. When using the increasing method described in the pattern specifically used for double knitting and making a triangle shape, there ended up being little loops on the side of the points where the newly cast on stitches were employed. This doesn’t really show up if you’re using a thick enough yarn to fill out that extra looseness in the e-wrapped add-ons, but they do definitely show up with thinner type yarns. If you follow the instructions just as written, but instead of wrapping those added increase pegs on each end as normal, you create them by using the half hitch technique, you will almost completely eliminate those extra loops! YAY! What is the half hitch? If you have the new book, it is described in the Knitty Gritty section. It’s also shown on the DVD some of the book backers received (more info about that DVD coming soon!). In essence, you will wrap exactly the same way, but will twist the working yarn in your fingers THE OPPOSITE WAY as an e-wrap, so that your WY will cross UNDERNEATH your wrap when placed on the peg. This helps lock that wrap in place and it won’t elongate after knitting off, which is what tends to happen with the e-wrap method. Does this make sense? Give it a try and see what you come up with! 🙂 You can also find the updated version of Servin’ Up Stripes Table Runner pattern on the Freebies Page here. 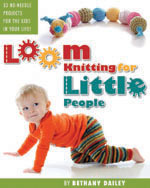 This entry was posted in Free Loom Patterns, Loom Alongs, Loom Knitter's Chat Clique, Loom Knitting, Looming Patterns, Tutorials. Bookmark the permalink. Thanks so much for the video – I couldn’t understand what you meant in the description but of course it makes perfect sense when you SEE it. THANK YOU!!! 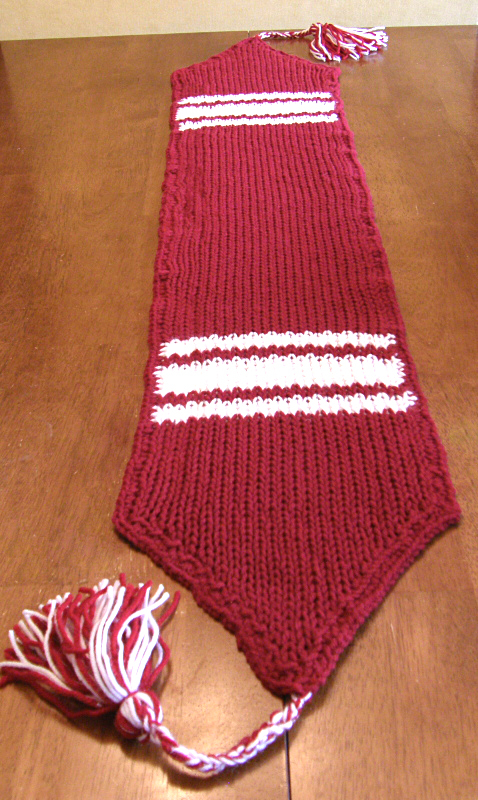 I have had to put the runner aside for now, while I work on things for our Craft Sale. And I had to order more wool! I initially planned on using a single strand, but it was just too thin and when I double it up I don’t have enough. How can we modify this to make a men’s necktie? I’m a newbie otherwise I could figure it out myself…….I think. Thank you.